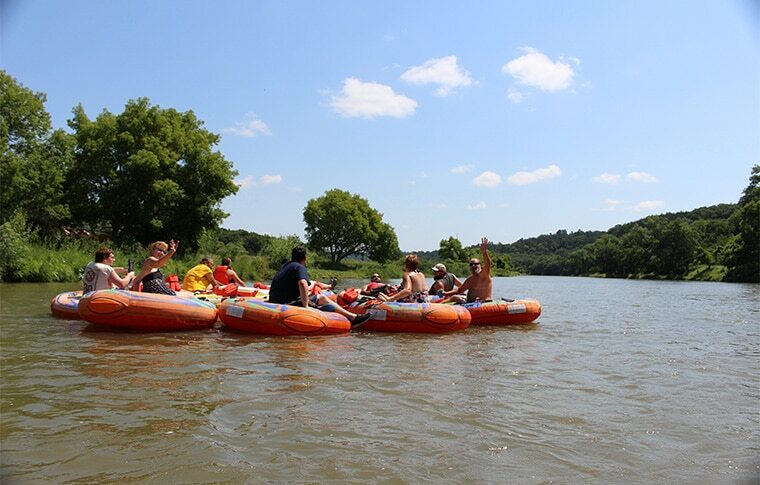 Join us on one of our tubing trips along a beautiful stretch of the Niobrara River. You'll have four hours to relax on a giant tube, floating down the slow flowing, Niobrara river. You'll pass the Smith Falls waterfall, the tallest waterfall in Nebraska as well as other areas of outstanding natural beauty. Located at 1005 East Highway 20, Valentine, NE, 69201. We will then instruct you to Berry Bridge launch point where you will begin your trip. Located at 1005 East Highway 20, Valentine, NE, 69201. We will then instruct you to Brewer Bridge to leave your vehicle, then take you to your launch point at Berry Bridge. For groups of 8+ we can shuttle you from hotels/motels and drop you back after your tubing experience. This cost of the tubing + hotel shuttle is $70 per person. Enjoy a wonderful afternoon effortlessly gliding down the river on an inflatable tube. Your tube will be hooked up to the other people in your group so you don’t need to worry about drifting apart! On this trip you’ll have the chance to see the impressive Smith Falls waterfall, Nebraska’s highest waterfall. Take this opportunity to enjoy the amazing scenery surrounding Nebraska’s scenic Niobrara River. Staying close to the Niobrara? We can meet you at the Little Outlaw Office and instruct you to Brewer Bridge. There, you will leave your car and we will shuttle you up to Berry Bridge, your launch point. These guys are the real deal! If you want a fun group adventure on Niobrara look no further!